« Does the observational evidence in AR5 support its/the CMIP5 models’ TCR ranges? Since AR4, there have been a series of new multiproxy studies, several of which were cited in AR5 (Mann et al 2008; Ljungqvist et al 2010; Christiansen and Ljungqvist 2012; Shi et al 2013). A distinctive feature of these and other recent multiproxy studies is the incorporation of varve thickness and near-equivalent mass accumulation rate (MAR) series, in which varve thickness (positively oriented) is interpreted as a direct proxy for temperature. The following table shows the usage of varve thickness and near-equivalent mass accumulation rate (MAR) series in post-AR4 multiproxy studies (“long” series shown below). It is evident that the varve thickness data in multiproxy studies is anything but “independent”. Table 1. 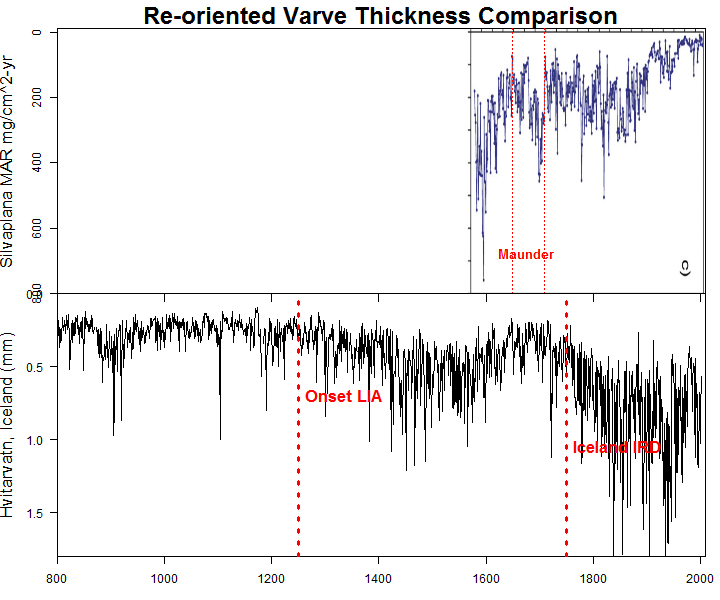 Varve thickness and MAR (mass accumulation rate) series used in multiproxy studies which are both “long” (including the medieval period) and which have not been truncated in the modern period. Both logged and unlogged versions are used. In a couple of cases, the mass accumulation rate is limited to organics (“dark”). I’ve also included the Igaliku pollen accumulation rate series, because it appears to me to be closely related to MAR series. XRD (Xray density not included). One of the most obvious features of the above table is the repeated use of a small number of varve thickness series used in Kaufman et al 2009: Big Round, Blue, C2, Donard, Iceberg and Lower Murray Lakes. Five of the six series were used in Shi et al 2013. In my recent discussion of Shi et al 2013, I observed that a composite of the five series (and the same is true for all six) had something of an HS-shape, though the series otherwise had negligible common “signal” (as demonstrated clearly by their eigenvalues). Further, several of the series (especially Iceberg which had been discussed in prior CA posts) had serious problems, compromising or potentially compromising any potential utility as a temperature proxy. This certainly suggested to me that the somewhat HS-ness of the varve thickness composite was more likely to be an artifact of selection from a noisy network rather than actual scientific knowledge. Skeptic blogs have long discussed this phenomenon, but it is one to which academic literature in the field has been wilfully obtuse. Blog discussion has been mostly based on red noise examples. So I think that readers may be interested in seeing the phenomenon at work with actual data. In the course of examining literature on varves, it quickly became evident that specialist literature prior to the relatively recent multiproxy articles had regarded thick varves as evidence of glacier advance (rather than “warmth”). Readers (and myself) wondered how the prior consensus (so to speak) that thick varves were related to glacier advance (and vice versa) had been replaced by a model in which thick varves were now interpreted as evidence of warmer temperatures. This proved to be an interesting backstory. I’ll also contrast the varve thickness series from Iceberg Lake, a canonical series in Kaufman et al 2009 and subsequent multiproxy studies, with “non-canonical” varve thickness series from Silvaplana, Switzerland and Hvitarvatn, Iceland, where thin varves are interpreted as evidence of warmth. The scientists most “responsible” for the introduction of varve thickness series as temperature proxies in multiproxy studies are arguably Jonathan Overpeck, Raymond Bradley and Darrell Kaufman, the latter a protégé and frequent co-author of Overpeck’s. 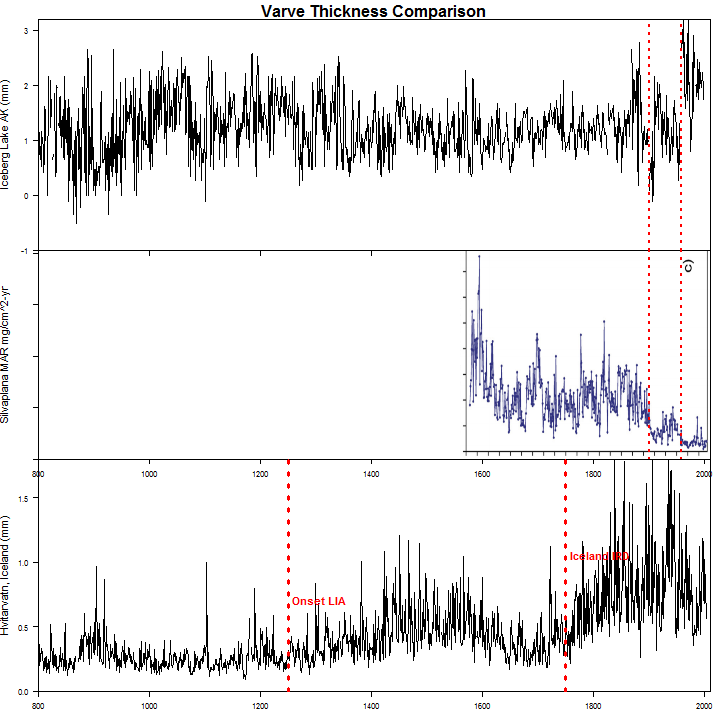 Bradley and Overpeck are both familiar to Climate Audit readers, but their connection to varve thickness data has not (to my recollection) been previously discussed here. In the late 1980s and early 1990s, Overpeck and Bradley both received numerous NSF grants for the development of varve data in the eastern Canadian Arctic. In various grant applications, Overpeck undertook to take sediment cores from 6-11 lakes (the precise number depends on overlap between proposals) and to create a large public database. The number of published Overpeck cores seems noticeably fewer than the number that were promised: I have thus far located only two varve thickness series published by Overpeck or his students: Donard and Upper Soper Lakes in Baffin Island (Hughen et al 2000; Moore et al 2001), both sites having been drilled in the early 1990s. In the early 2000s, Hughen was separately funded to extend the Donard record, but thus far no results appear to have been published. In 2009, Hughen made a partial archive of data from Ogac Lake, unpublished and unarchived since the early 1990s. Winton Bay Lake and other Overpeck sites (if actually drilled) remain unpublished and unarchived. At the same time that Overpeck was receiving NSF funds for Baffin Island, NSF was funding Bradley for sediment cores in Ellesmere Island. This resulted in two short varve series (Tuborg – Smith et al 2004; C3 – unpublished) and one longer series (C2). Bradley and students (Hardy et al 1996; Lamoureux and Bradley 1996) reported a positive correlation between local temperatures and C2 varve thickness in the (short) instrumental period, a correlation that was widely cited in later varve literature purporting to justify temperature reconstructions from varve thickness. In 1997, Overpeck was lead author of the first multiproxy study (Overpeck et al 1997) to incorporate varve thickness data into a multiproxy composite (four centuries from 1600AD on). Included in the 29 Arctic proxy series of Overpeck et al 1997 were two of his own series (the then unpublished Donard and Upper Soper series), three Bradley series (C2 and the unpublished Tuborg and C3) plus a very short Arctic island series from Gajewski (DV09). In 2005, NSF again funded Overpeck (including Kaufman, who by then had joined Overpeck at the University of Arizona) to collate Arctic lake sediment data. This resulted in a special 2009 volume of the Journal of Paleolimnology, in which several now “canonical” series were published: Iceberg Lake, Alaska – Loso 2009; Big Round Lake, Baffin Island – Thomas and Briner 2009; Blue Lake, Alaska – Bird et al 2009; and a new series from Bradley and his students: Lower Murray Lake, Ellesmere Island – Cook et al 2009. In the same volume, Kaufman et al 2009 (lead author Kaufman, senior author Overpeck, co-author Bradley) introduced a new multiproxy reconstruction, in which lake sediment series (and especially varve thickness series) played a much more prominent role. Kaufman et al 2009 had 23 series, of which the majority (12) were lake sediment series. It also included 4 tree ring series (including a Yamal superstick) and 7 ice core series. The ice core data is fairly nondescript in the period. Thus, any HS-ness in the data results from the tree ring data (especially Yamal) and the varve data. In addition to the six “canonical” varve thickness series (Big Round, Blue, C2, Donard, Iceberg and Lower Murray), Kaufman et al 2009 also used three Finnish lake sediment series, which attracted much commentary, the usage of which I will briefly parse in an Appendix below. In both Kaufman et al 2009 and nearly all subsequent usage, these series were used in a truncated form, thereby avoiding the contamination that became controversial as a result of Mann et al 2008. The one exception was Tingley and Huybers 2013 (Nature), which also used the contaminated portion of the Korttajarvi data in a very superstick form. PAGES2K’s use of the Igaliku data was a similar error discussed at CA in the past here ^. Combinations of the “canonical” varve thickness series were used in all subsequent multiproxy studies (Ljungqvist 2010; Christensen and Ljungqvist 2011; Christensen and Ljungqvist 2012; Kjungqvist et al 2012; Shi et al 2013; Tingley and Huybers 2013; PAGES2k Arctic 2013.) Sometimes, the series are used after taking logarithms; sometimes not. Some studies also include shorter varve series (e.g. DV09, Upper Soper). The most recent studies (Tingley and Huybers 2013; PAGES2K) include “new” varve thickness series from Ogac Lake and Hvitarvatn respectively. However, Ogac Lake is not really “new” – while it was only archived in 2009, it was collected by Overpeck in 1992-93 at the same time as Upper Soper Lake and the still unarchived Winton Bay series. Numerous varve thickness series, that have been reported in specialist literature, remain unarchived, including Hector Lake (Leonard); Cheakamus Lake (Menounus) and Silvaplana (various authors). The most HS-shaped series of the six canonical varve thickness is the highly problematic Iceberg Lake AK series (Loso 2009), discussed on several occasions at CA (see tag) and used in ALL multiproxy studies subsequent to Kaufman et al 2009. I will re-visit it today, contrasting it with two “non-canonical” series – Hvitarvatn and Silvaplana. Despite its repeated use, the series is defective and should never have been incorporated into these studies. Warnings against its use were sounded at CA even before Kaufman et al 2009 – see many thoughtful comments in a 2007 CA thread here. Iceberg Lake is dammed by an unstable moraine and, over the past 200 years or so, Iceberg Lake has experienced a series of dramatic changes in lake level as the channel changed path. The most recent change occurred in 1957, when the shoreline was lowered by 25.7 meters (from 959.0 to 933.3 meters). Varve thickness is dramatically affected by closeness to the inlet. The 1957 event at Iceberg Lake resulted in extremely thick layers at the time of the event as well as ongoing thicker varves – see top panel of Figure 1 below. Figure 1. Top – Iceberg Lake (Loso 2009); middle – Silvaplana, Switzerland (Blass et al 2007); bottom – Hvitarvatn, Iceland. (Miller et al 2012). Loso was aware of the 1957 event (which is clearly disclosed in his article) and excluded 1957 values from his composite – a limited hangout that ignored the post-1957 inhomogeneity. Loso 2009 acknowledged the inhomogeneity resulting from change in inlet location, but his remedy completely missed the point: Loso merely used log values in his temperature reconstruction, a device that was irrelevant to the inhomogeneity (as pointed out at CA at the time). In Loso’s most recent publication (Dietrich and Loso 2012), Loso acknowledged inhomogeneity in the Iceberg Lake series, but did not withdraw or amend the 2009 version of the series, which remains in near universal use in multiproxy studies. In order to highlight these issues, I’ve plotted Silvaplana (Switzerland) varve data in the middle panel, showing 1957 as a dotted red line. At Silvaplana, 20th century varve thicknesses decline dramatically from Little Ice Age values, the exact opposite of what one expects under the Overpeck-Bradley-Kaufman linear model. In related articles, Silvaplana authors report a close association on a decadal-centennial scale between varve thickness and glacier advance, an association matching the common sense understanding of the Little Ice Age. We found a significant positive correlation between local summer air temperature (May-September) and the annual sediment mass accumulation rate (MAR) in Lake Silvaplana (46°N, 9°E, 1800 m a.s.l.) during the twentieth century (r = 0.69, p < 0.001 for decadal smoothed series). Sediment trap data (2001-2005) confirm this relation with exceptionally high particle yields during the hottest summer of the last 140 years in 2003. On this base we developed a decadal-scale summer temperature reconstruction back to AD 1580. Surprisingly, the comparison of our reconstruction with two other independent regional summer temperature reconstructions (based on tree-rings and documentary data) revealed a significant negative correlation for the pre-1900 data (ie, late ‘Little Ice Age’). This demonstrates that the correlation between MAR and summer temperature is not stable in time and the actualistic principle does not apply in this case. We suggest that different climatic regimes (modern/‘Little Ice Age’) lead to changing state conditions in the catchment and thus to considerably different sediment transport mechanisms. Therefore, we calibrated our MAR data with gridded early instrumental temperature series from AD 1760-1880 (r = -0.48, p < 0.01 for decadal smoothed series) to properly reconstruct the late LIA climatic conditions. In the third panel of the above Figure, I’ve shown the varve thickness series from Hvitarvatn, Iceland that I’ve recently discussed, since its authors (Miller et al 2012) also associated varve thickness on a centennial scale with glacier advance rather than warmer temperatures. Although its interpretation matches that of the authors of Silvaplana, the timing of the series is definitely not synchronous with Silvaplana. Whereas varve thicknesses at Silvaplana have declined in the 20th century, 20th century varve thicknesses at Hvitarvatn are among the thickest in the entire record. Despite the apparent inconsistency, I think that it may be possible to extract a consistent story from this data, incoherent as it seems. I’ve flipped the Silvaplana and Hvitarvatn series in the figure below so that “warm” is up. Thus oriented, the Silvaplana varves provide a convincing record of recovery from the Little Ice Age, with the modern thin varves standing as evidence of glacier retreat. Figure 2. Re-oriented varve thickness series from Figure 1. In contrast, the Hvitarvatn record suggests to me that the Little Ice Age in Iceland was (unsurprisingly) much more intense than in Switzerland and that recovery remains incomplete. It seems virtually certain to me that Hvitarvatn varves will become thinner over the 21st century as the glacier recedes. That present varves are thicker than medieval varves indicates to me that present glacier retreat, rapid as it may be, has still not reached medieval (and Holocene) retreat stages. In picturing glaciers this way, I am (in my own mind) picturing glaciers as a sort of Last In-First Out inventory – a form of non-linearity that is intuitive in business applications and which seems completely applicable here. Under this concept, Switzerland would have entered the LIA later than Iceland and left sooner. I mention the above concept with the following caveat: defects in my interpretation of the varve thickness series are irrelevant to the garbage-ness of their use as linear proxies for temperature in multiproxy studies. I see no redeeming qualities in the Overpeck-Bradley-Kaufman interpretation of this data. Even if modern temperatures are warmer than medieval temperatures (a distinct possibility), it is my view that any HS-ness in the composite of varve thickness series used in recent multiproxy studies is entirely artifact and does not represent an authentic HS signal. In the preparation of this note, I closely examined the versions of the various Finnish series (including upside-down Tiljander) used in the multiproxy studies, which I’ll place here as a sort of memo to file. Mann used four Korttajarvi series: three varve thicknesses series: light thickness, dark thickness and combined thickness; and X-ray density (XRD). The enormous supersticks were in the thickness series, rather than XRD, which had elevated 20th century levels, but not crazy levels (like the other series). Tiljander oriented light thickness, combined thickness and XRD negatively; thus, for these series, in addition to using contaminated data, Mann used them upside-down to the interpretation of the original authors (an interpretation which some Mann defenders contest). Dark laminae thickness is less common in this field, but occasionally used by others e.g. Overpeck at Upper Soper Lake, Baffin Island. Kaufman used the Korttajarvi XRD series (not thickness), but cut off at AD1800 because of modern contamination. Kaufman originally used this series upside down to the orientation of the original authors, but reversed the orientation in their corrigendum. Since they had already truncated the series at 1800AD, the flip had little effect on their final result. It is useful to note that Kaufman had no difficulty in understanding what it meant to use this series “upside down” – though many commenters e.g. William Connolley have pretended that no climate scientist could reasonably be expected to understand this criticism without much greater elaboration. The Korttajarvi series was avoided in Ljungqvist studies, other than Ljungqvist et al 2012, where the XRD series truncated to 1899 was used in negative orientation. However, the Korttajarvi superstick (bizarrely) re-emerged in Tingley and Huybers 2013, who used the supersticked varve thickness (dark laminae) without truncation or apology. PAGES2K used a truncated version of the XRD series in negative orientation. Kaufman also introduced the Lehmilampi varve thickness series. Kaufman originally used it in positive orientation, slightly truncated back to 1945. It had elevated closing values, but not supersticked. In their corrigendum, Kaufman inverted the Lehmilampi varve thickness series to match the interpretation of the original authors – thin varves now denoting warmth – retaining the 1945 truncation. Lehmilampi was not used in the Ljungqvist studies except for Ljungqvist et al 2012, which used the XRD data in negative orientation (as with the other Finnish sites). PAGES2K returned to use of varve thickness, again inverted and truncated to 1800AD. Nautajarvi, the third Finnish series used by Kaufman, was another varve thickness series (dark laminae thickness used in positive orientation) which was truncated in AD1800. It was left unchanged in the Kaufman corrigendum. As with the other Finnish series, in the Ljungqvist studies, the site was only used in Ljungqvist et al 2012, where the XRD data was used in negative orientation (consistent with Ljungqvist et al 2012 policy on the other two sites). PAGES2K reverted to the use of dark laminae thickness in positive orientation, truncated to 1800AD. This entry was written by Stephen McIntyre, posted on Dec 14, 2013 at 2:31 PM, filed under Uncategorized and tagged big round, bradley, c2, donard, hvitarvatn, iceberg lake, kaufman, korttajarvi, ljungqvist, overpeck, pages2k, silvaplana, varve. Bookmark the permalink. Follow any comments here with the RSS feed for this post. Both comments and trackbacks are currently closed. Data discipline, where art thou? How come you can do this work but “climate scientists” do not? Bad link at the end of this sentence: ” PAGES2K’s use of the Igaliku data was a similar error discussed at CA in the past here ^. Acerbic wit at its best! Simply varvelous, the glaciers do perform. Loso was aware of the 1957 event (which is clearly disclosed in his article) and excluded 1957 values from his composite – a limited hangout that ignored the post-1957 inhomogeneity. Scientist as spy or, at best, propagandist. Limited hangout worth a google if unfamiliar. Hm, maybe glaciers advance when it’s warm? A new physical fenomalnon? I find it very odd that there seems to be no attempt to identify the type of pollen in these cores. Modern PCR techniques allow you to quantify the amount of DNA, from a multitude of species, of individual species. You could, with ease, test a sample for the absolute levels of 80 different species of pollen, with 16 internal controls, in a day. It would not take all that long to explore the organic layers and know the sort of ecosystem that was present at the time the pollen sedimented. The ecosystem that laid down pollen will give you a rather good proxy of climate of the time. There are quite a few lake studies where pollen was identified by eye, very man-power intensive, but the polar studies seem to ignore this angle. Are the cores taken by these scientists preserved in cold, humid, long term storage? Steve: there are numerous pollen studies of Arctic lake sediments, though not used in many studies because of lower resolution. Another day’s story. Thank you Steve, I look forward to it. Indeed palynology is probably a much better climate proxy than varves (or treerings for that matter). Indeed for a long time it was considered as essentially the only workable climate proxy. However it has low temporal resolution and large lags, particularly for warming, so it is pretty useless for short-term hockeysticking. Trees for example don’t disperse more than a few kilometers per year, no matter how good the conditions are. Another problem, often ignored with biological proxies, is that no amount of climatic change can cause reactions in species that aren’t there. Suppose for example that temperatures were to rise abruptly on Iceland. Undoubtedly, in time, a number of warmth-demanding species would appear, but they would first have to disperse across wide water-barriers, by wind, or by birds or by floating across, which might take thousands of years, and will indeed never happen for many species that lack the ability to cross such water barriers. In the appendix, it would be helpful to clarify positive and negative orientation. Is positive orientation where greater thickness or density = more warming? XRD normally refers to an analytical technique: X-Ray Diffraction. Do we now have a re-definition with D=density? When I read Silvaplana, I wanted to look where it was – somehow the name rang a bell. Well. The good thing is, it is located in a more remote location of the Alps. The bad thing is that doesn’t mean much, even without 1957. I would venture, that at any location in the Alps one would find an “anthropogenic fingerprint” (or footprint?) – but it probably isn’t carbondioxide, and is not even necessarily temperature. Doesn’t modern science teach us that all footprints are carbon footprints? What did the Romans ever do for us and our varves? What part of the phrase “non-canonical” don’t you understand? All these stories must, by definition, be apocryphal. A view of St. Moritz and lej da S. Murezzan. Silvaplana and his Lake are located 5km further upstream on the road Malojapass. Nietche was misguided but in my humble opinion, this was not the fault of the landscape. Sorry, small correction: the rock of the eternal recurrence is not located in the peninsula of Sils Maria but at Surlej, in the varves of Silvaplana Lake. Mr. McIntyre. The main inconsistency within paleoclimate is what in the IPCC AR5 WGI is set as “5.3.3.2 LGM Constraints on Equilibrium Climate Sensitivity”. I tried to discuss (with one leading author of that Chapter 5) the three ways IPCC shows for correlating LGM with ECS; but he declined that discussion. I concluded that the multiproxy inconsistency (related with the varved inconsistency evidenced in this post), create inaccuracies that drive to opposite ECS estimations. Mr. McIntyre, do you have a contact email? I would like to talk with you about presenting some of the ideas in my pdf in your blog. With so many historic measurements obviously affected by temperature, it is truly unfortunate that they are so painfully useless as temperature proxies. Sediment is obviously a really terrible proxy. Perhaps one of the worst. Tree-lines may be the best but even those suffer. It would be awesome if something new and overlooked were discovered. You raise an interesting question. What else is out there that might convey historical temperature data? If brains can still storm, here is an opportunity. The filter would include that the data be collectible by post-grads, or at worst post-docs, that it be cyclic and be date-able, that it occur globally, and that the series (if that is a proper term) be continuous for millenia. What else could there be? Doubtless the paleo-practitioners have spent countless hours in pubs dreaming of better proxies. But what? There are already material of high quality. Perhaps what show this material is not what we wanted to discover? Are you serious or tongue in cheek? Take five minutes to understand what the graph shows and you will get the answer. For the first time, we have good proxy data until 2006 and therefore a significant overlap with satellite data. Overall, MXD show an excellent correlation with temperature. This is not new. What is, is that for the first time, we can observe an almost perfect correlation with TLT in high and low frequencies. For Urals at least, the very famous divergence is clearly the result of a failure in stations data and not a weakness of the MXD proxy. Treemometers are more reliables than thermometers of stations. Eyeballing that plot, the MXD seems to match the annual wiggles of HADCRUT3 and UAH pretty well The problem with that MXD plot (from a warmist point of view) is that it appears to show a long term trend close to zero. That is very interesting Phi. I saw what you were getting to before reading your description. It’s a single dataset, but oh the Irony if even only partially true. C’mon, next your gonna tell me you can make sense of varves. I did take my time. I just don’t know what you are concluding from that. The MXD data that I’ve messed with had very poor temp correlation. Of course there is some high frequency matching but that’s about all. I suppose I will try to find the paper it came from and review it. Jeff: Good high-frequency correlation with temperature may be the best sign that the trees in a particular location to respond strongly to local temperature and there is a lot of high frequency data. Annual variability in local temperature is high, so there can be information about the dynamic range of the response in TRW. If the climate changes, temperatures may move outside the range of response seen during instrumental periods, but a big change multi-decadal climate might be 1 degC while normal variation in growing season temperature is probably several times bigger. So changing climate might not take temperatures very far or very into temperatures that haven’t been seen during the instrumental period. So your hypothesis is that “treenometers” tele-communicate with global temperatures? No, Why? The comparison is done with regional temperatures (5°x5° grid) and not with global temperatures. So we see that the varvologists have not gotten sloppy and lazy, they continue to earnestly seek the truth even as their less cautious colleagues invent a sort of varve numerology. Varves can be useful as evidence for high-amplitude low-frequency climate events such as the Holocene climate optimum. In Lake Silvaplana there is a continuous varve record dating back to 3,500 years b.p., and also for the period 13,000 b.p. to 9,500 b.p. (Ohlendorf et al, 1997). For the intervening 6,000 year period: sediment, but no varves. This may mean that the lake and its tributary streams did not freeze every winter as they do now. I have given up trying to find a contact button or any other method of relaying this information regarding links that I have come across that did not work, this way was the only option. Thought you may be interested and would fix them as well. UPDATE: Also see my Ohio State presentation for a “more recent review.” shows a 404 error. 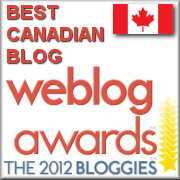 Steve: when the blog changed to wordpress, many links were broken. Try substituting http://www.climateaudit.info for http://www.climateaudit.org for broken links. It’s too big a job for me to try to fix them all. Small amounts of data , poorly used and little to no data control or availability of raw data required for verification. .
Stinks of poor science for sure , but then we are talking climate ‘science’ so just normal procedure for these guys , and still the grant cash comes rolling in so why should they change ? Varves are great proxies because there is a reasonably reliable physical mechanism that creates annual layers, but the thickness of these layers is certainly not directly controlled by temperature. If one imagines a step function in temperature, for example, that causes a nearby glacier to retreat or advance, one would anticipate diminishing or increasing effects on varve thickness and changing effects as the stream between the glacier and the lake evolved. The amount of organic material in varves, however, may be controlled by temperature since temperature controls the length of the growing season and may co-vary with the amount of sunlight. However, all of the organic material produced in one growing season does not get deposited in the lake or swept from the local watershed in one season. Looking for both immediate and lagged relationships might make more sense. Steve: my impression is that the thickness of dark laminae (organics) strongly covaries with the thickness of light laminae (inorganic), indicating that glacier proximity influences the thickness of dark laminae as well. One possible (or related) reason is that varve thickness depends on closeness to the inlet in the lake – a phenomenon noted at Iceberg Lake though not attended to in the Loso reconstruction. If the inlet is relatively close, then both dark and light laminae will be thicker. Thus while dark lamina thickness may make more “sense” on the surface, it would be a large job to show that such a simple expedient resolves the problem. I doubt that it is possible. Steve: I suspect that both the dark and light layers are composed of both inorganic and organic material, with the dark layer containing far more organic. Rather than measure the thickness of the dark layer, I was thinking about assaying layers for the amount of carbon or organic carbon and reporting the total amount or percentage of organic carbon in each layer. I’m hypothesizing each layer might record a measure of the photosynthetic productivity of the area upstream of the sampling site and that photosynthetic productivity depends on the temperature of the growing season.